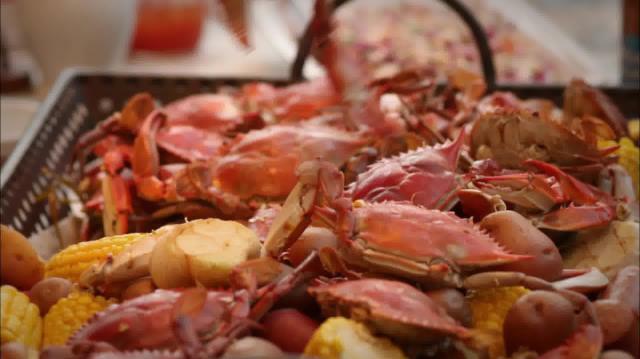 Are you ready for a crab boil? Haylie Duff tackles her family’s summertime crab boil tradition for the first time and the pressure is on! Not only are there live crabs to boil, but Haylie also wants to make her sister Hilary Duff’s famous Black Bean Chocolate Cake. Luckily Mama Duff, sister Hilary, and Haylie’s guy friends stop by to help prepare the big meal. Can Haylie, who isn’t normally a baker, match her sister’s recipe and keep the family crab boil tradition alive? Alton Brown's Bubbly Tastes like WHAT!? Preheat oven to 325 degrees. Spray two 9-inch cake pans with extra virgin olive oil or coconut oil cooking spray and sprinkle cocoa on the inside of the pan, tapping evenly to coat. Drain and rinse black beans in a strainer. Combine beans, 6 eggs, vanilla, stevia and salt into blender. Blend on high until beans are completely liquefied. In a separate bowl, whisk together cocoa powder, baking soda and baking powder. In a stand mixer, beat butter with honey and turn on high until light and fluffy. Add remaining 4 eggs one at a time, beating for a minute each. Pour bean batter into the egg mixture and mix until smooth. Stir in cocoa powder and beat batter for one minute. Pour batter into cake pans and smooth the tops. Bake each cake pan for 40-45 minutes. Take cake pans out of oven to cool and after 10 minutes, turn out cake from pan and flip on to a cooling rack. Let cool until cake reaches room temperature. Frost the cakes immediately before serving with frosting of your choice. Beat butter for a few minutes with a mixer on medium speed. Add 3 cups of powdered sugar and turn your mixer on the lowest speed(so the sugar doesn't blow everywhere) until the sugar has been incorporated with the butter. Increase mixer speed to medium and add vanilla extract, salt, and 2 tablespoons of milk/cream and beat for 3 minutes. Mix in cocoa powder and blend. If your frosting needs a more stiff consistency, add remaining sugar. If your frosting needs to be thinned out, add remaining milk 1 tablespoons at a time. Place all ingredients into bowl. Mix all dressing ingredients together in a jar. Add dressing to salad bowl thinly coating leaves. Place and add goat cheese on top of salad.